Easy to grown Loves the sun Height: Up to 25 feet Hardy in zones 4-9 Immediate shipping in 4" pot. Shipped dormant in the winter. 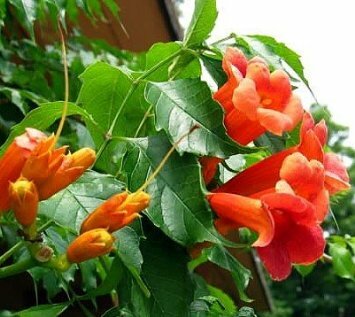 A deciduous climbing vine that is easy to grow and an American native. Attractive to hummingbirds, butterflies and bees, this would be a great addition to a butterfly garden. Will cling to garden structures and will grow rampantly in full sun or partial shade. Will grow in any average soil. Prune back to a few buds in the early spring, as flower buds form on new growth.